Aberystwyth (Mouth of the Ystwyth, /ˌæbəˈrɪstwɪθ/, Welsh: [abɛɾˈəstʊɨθ]) is a historic market town, administrative centre, and holiday resort within Ceredigion, West Wales, often colloquially known as Aber. It is located near the confluence of the rivers Ystwyth and Rheidol. 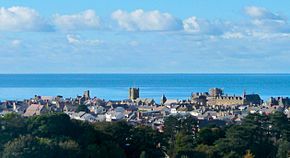 Historically part of Cardiganshire, since the late 19th century, Aberystwyth has also been a major Welsh educational centre, with the establishment of a university college there in 1872. At the 2001 census, the town's population was 15,935; it was reduced to 13,040 at the 2011 Census. During nine months of the year, there is an influx of students—to a total number of 10,400 as of September 2012. Including the suburbs of Llanbadarn Fawr, the population is 16,420. The town is situated near the confluence of the rivers Ystwyth and Rheidol, on the west coast of Wales. Although the name may seem to suggest otherwise, only the River Rheidol passes through the town; following the reconstruction of the harbour, the River Ystwyth skirts the town. Aberystwyth has a pier and a seafront which stretches from Constitution Hill, at the north end of the Promenade, to the mouth of the harbour at the south, taking in two separate beach stretches divided by the castle. Today, it essentially comprises a number of different areas: Aberystwyth town, Llanbadarn Fawr, Waunfawr, Llanbadarn, Trefechan, Penparcau (the most populous). Aberystwyth is an isolated town, considering the population density of the United Kingdom. The nearest substantial settlements are located at least 1 hour 45 minutes' drive away: Swansea, to the south, is 70 miles (110 km) away; Shrewsbury, in Shropshire, England, to the east, is 75 miles (120 km) away; and Wrexham, to the north-east, is approximately 80 miles (130 km) away. The Welsh capital, Cardiff, is over 100 miles (160 km) away. London is 210 miles (340 km) distant from Aberystwyth. Aberystwyth experiences an oceanic climate (Köppen climate classification Cfb) similar to almost all of the United Kingdom. This is particularly pronounced due to its west coast location facing the Irish Sea. Air undergoes little land moderation and so temperatures closely reflect the sea temperature when winds are coming from the predominant onshore (westerly) direction. The nearest Met Office weather station is Gogerddan, 3 miles to the northeast, and at a similar elevation. The absolute maximum temperature is 34.6 °C (94.3 °F), set during July 2006. This is also the July record maximum for all of Wales, suggesting that the area's low lying situation, aided by a possible föhn effect when winds are offshore can act to achieve high temperatures on occasion. Typically the warmest day will average 28.0 °C (82.4 °F) and 5.6 days will achieve a maximum of 25.1 °C (77.2 °F) or above. The absolute minimum temperature is −13.5 °C (7.7 °F), set in January 2010. Typically 39.8 days will register an air frost. Rainfall averages 1,112 mm (44 in) a year, with over 1mm recorded on 161 days. All averages refer to the 1971–2000 period. Aberystwyth is a tourist destination, and forms a cultural link between North Wales and South Wales. Constitution Hill, scaled by the Aberystwyth Cliff Railway, gives access to panoramic views and to other attractions at the summit, including a camera obscura. Scenic Mid Wales landscape within easy reach of the town includes the wilderness of the Cambrian Mountains, whose valleys contain forests and meadows which have changed little in centuries. 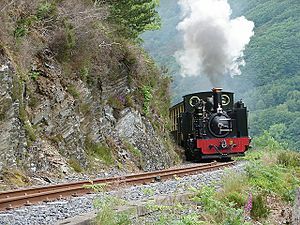 A convenient way to access the interior is by the preserved narrow-gauge Vale of Rheidol Railway. Although the town is relatively modern, there are a number of historic buildings, including the remains of the castle and the Old College of Aberystwyth University nearby. The Old College was originally built and opened in 1865 as a hotel, but after the owner's bankruptcy the shell of the building was sold to the university in 1867. The new university campus overlooks Aberystwyth from Penglais Hill to the east of the town centre. The station, a terminus of the main railway, was built in 1924 in the typical style of the period, mainly in a mix of Gothic, Classical Revival, and Victorian architecture. The town is the unofficial capital of Mid Wales, and several institutions have regional or national offices there. Public bodies located in the town include the National Library of Wales, which incorporates the National Screen and Sound Archive of Wales, one of six British regional film archives. The Royal Commission on the Ancient and Historical Monuments of Wales maintains and curates the National Monuments Record of Wales (NMRW), providing the public with information about the built heritage of Wales. 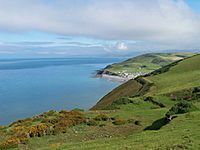 Aberystwyth is also the home to the national offices of UCAC and Cymdeithas yr Iaith Gymraeg (Welsh Language Society), and the site of the Institute of Grassland and Environmental Research. The Welsh Books Council and the offices of the standard historical dictionary of Welsh, Geiriadur Prifysgol Cymru, are also located in the town. There is evidence that during the Mesolithic Age the area of Tan-y-Bwlch at the foot of Pen Dinas (Penparcau) was used as a flint knapping floor for hunter-gatherers making weapons from flint that was deposited as the ice retreated. The remains of a Celtic fortress on Pen Dinas (or more correctly 'Dinas Maelor'), a hill in Penparcau overlooking Aberystwyth, indicates that the site was inhabited before 700 BC. On a hill south of the present town, across the River Ystwyth, are the remains of a medieval ringfort believed to be the castle from which Princess Nest was abducted. This rare survival is now on private land and can only be accessed by arrangement. The recorded history of Aberystwyth may be said to date from the building of a fortress in 1109 by Gilbert Fitz Richard (grandfather of Richard de Clare, known as Strongbow, the Cambro-Norman lord notable for his leading role in the Norman invasion of Ireland). Gilbert Fitz Richard was granted lands and the lordship of Cardigan by Henry I, including Cardigan Castle. The fortress built in Aberystwyth was located about a mile and a half south of today's town, on a hill over the south bank of the Ystwyth River. Edward I replaced Strongbow's castle in 1277, after its destruction by the Welsh. His castle was, however, built in a different location, at the current Castle Hill, the high point of the town. Between the years 1404 and 1408 Aberystwyth Castle was in the hands of Owain Glyndŵr but finally surrendered to Prince Harry (the future King Henry V of England). Shortly after this, the town was incorporated under the title of Ville de Lampadarn (the ancient name of the place being Llanbadarn Gaerog or the fortified Llanbadarn, to distinguish it from Llanbadarn Fawr, the village one mile (1.6 km) inland. It is thus styled in a Royal charter granted by Henry VIII but, by Elizabeth I's time, the town was invariably named Aberystwyth in all documents. In 1649, Parliamentarian troops razed the castle, so that its remains are now inconsiderable, though portions of three towers still exist. In 1988, an excavation within the castle area revealed a complete male skeleton, deliberately buried. Though skeletons rarely survive in Wales' acidic soil, this skeleton was probably preserved by the addition of lime from the collapsed building. Affectionately known as "Charlie" and now housed in the Ceredigion Museum in the town, he probably dates from the English Civil War period, and is likely to have died during the Parliamentarian siege. His image is featured in one of nine mosaics created to adorn the castle's walls. Hafod Uchtryd was a mansion built by Thomas Johnes from 1783, part of it being designed by John Nash. The landscaped gardens were formed by blasting away parts of hills to create vistas. Roadways and bridges were built and hundreds of thousands of trees were planted. The result was a landscape that became famous and attracted many visitors including Samuel Taylor Coleridge, and it is believed to have inspired a passage in his poem Kubla Khan. The house was demolished in 1955, but the landscape remains today. Rural industries and craftsmen were an important part of life in a country town. The local trade directory for 1830 shows that there were in Aberystwyth: Twenty boot makers, eight bakers, two corn millers, eleven carpenters and joiners, one cooper, seven tailors, two dressmakers, two straw hat makers, two hat makers, three curriers, four saddlers, two tinsmiths, six maltsters, two skinners, four tanners, eight stonemasons, one brewer, four lime burners, three shipwrights, three wheelwrights, five cabinet makers, one nail maker, one rope maker and one sail maker. The Cambrian Railways line from Machynlleth reached Aberystwyth in 1864, closely followed by rail links to Carmarthen, which resulted in the construction of the town's impressive station. 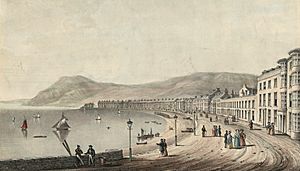 The Cambrian line opened on Good Friday 1869, the same day that the new 292 metres (958 ft) Royal Pier (designed by Eugenius Birch) opened, attracting 7,000 visitors. The railway's arrival gave rise to something of a Victorian tourist boom; the town was once even billed as the "Biarritz of Wales". 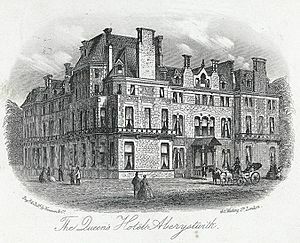 During this time, a number of hotels and fine townhouses were built including the Queens Hotel, later renamed Swyddfa'r Sir (County Office) when used as offices by the town council, and most recently used as the external scenes of the police station in the television show Hinterland. One of the largest of these hotels, "The Castle Hotel", was never completed as a hotel but, following bankruptcy, was sold cheaply to the Welsh National University Committee, a group of people dedicated to the creation of a Welsh University. The University College of Wales (later to become Aberystwyth University) was founded in 1872 in this building. 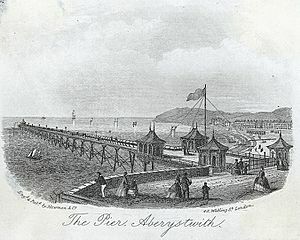 Aberystwyth was a contributory parliamentary borough until the Third Reform Act, which merged its representation into that of the county in 1885. In 1895, various businessmen who had been behind the Aberystwyth New Harbour Company formed the Aberystwyth Improvement Company (AIC) to take over the works of the defunct Bourne Engineering & Electrical. In 1896, the AIC completed three projects: the new landside pavilion for the Royal Pier; built the Cambria Hotel (later the United Theological College) and formed Constitution Hill Ltd, to develop a Victorian theme park. Chief engineer George Croydon Marks designed all the AIC developments, including the United Kingdom's longest funicular railway, which takes passengers up a 50% gradient to a park and camera obscura. Aberystwyth hosted the National Eisteddfod in 1865, 1916, 1952 and 1992. On the night of Friday, 14 January 1938, a storm with estimated wind speeds of up to 90 mph (140 km/h) struck the town. Most of the promenade was destroyed, along with 200 feet (60 m) of the pier. Many properties on the seafront were damaged, with every property from the King's Hall north affected; those on Victoria Terrace suffered the greatest damage. Work commenced on a protective coffer dam until 1940, with total costs of construction coming to £70,000 (equivalent to £2.5 million today). Cymdeithas yr Iaith Gymraeg (Welsh language Society) held their historic first protest on Trefechan Bridge in Aberystwyth, on 2 February 1963. The first independent Welsh Evangelical Church was established in Aberystwyth (see Evangelical Movement of Wales). On 1 March 2005, Aberystwyth was granted Fairtrade Town status. In March 2009 mayor Sue Jones-Davies, who had played the role of Judith Iscariot in the film Monty Python's Life of Brian (1979), organised a charity screening of the film. Principal actors Terry Jones and Michael Palin also attended. There is a popular, but incorrect, urban myth that the town had banned the film (as some authorities did) when it was first released. During the aftermath storms from Cyclone Dirk on Friday 3 January 2014, the town was one of the worst hit in Wales, with enormous swells uprooting boulders from the sea walls, leaving roads and pavements along the promenade buried under a mass of paving stones, bricks, shale and twisted metal. Properties on the adjoining promenade were then evacuated for the next five days, including 250 students from the University. Ceredigion Council appealed to the Welsh Assembly Government for funds, whilst Natural Resources Wales are still undertaking surveys and emergency preventative measures. The first ever public library in Aberystwyth was opened in Compton House, Pier Street on 13 October 1874. In 1882 the library was moved to the Assembly Rooms which were leased to the council for 21 years. The lease expired in 1903 and the library returned to Pier Street, this time to the Old Banking Library at the corner with Eastgate Street, although this was short lived. A Carnegie library was built in Aberystwyth in 1905, with a grant of £3,000. Located in Corporation Street, it was designed by the architect Walter Payton of Birmingham, who was one of 48 who entered the competition to design the building. It was formally opened on 20 April 1906 by Mrs Vaughan Davies, wife of the local MP. The Town Library moved to the old Town Hall, now known as Canolfan Alun R. Edwards, Queen's Square, in 2012, following the buildings refurbishment. The County Council vacated the Town Hall in a move to their purpose built offices on Boulevard de Saint-Brieuc in 2009. The National Library of Wales, Aberystwyth, is the national legal deposit library of Wales. Established in 1907, it is a Welsh Government sponsored body. According to Cyril Evans, the library's centenary events co-ordinator, "The library is considered to be one of the world's greatest libraries, and its international reputation is certainly something that all Welsh men and women are intensely ... proud of". Welsh is the main medium of communication within the organisation; it aims to deliver all public services in Welsh and English. 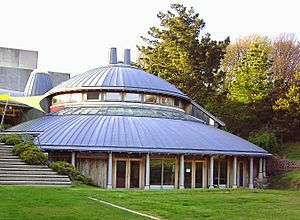 Aberystwyth Arts Centre is one of the largest and busiest arts centres in Wales. It encompasses a 312-seat theatre, 900-seat concert hall, 125-seat cinema, and has accompanied studio, galleries, plus public spaces which include cafes and a bar. Arad Goch is an Arts Council funded community theatre and art gallery based in the town. The premises holds a theatre, gallery, several art studios and meeting rooms, and a darkroom. The University Music Centre promotes a varied programme for instrumentalists, singers and listeners from the university and the wider community. The University chamber choir, The Elizabethan Madrigal Singers, have been singing in the town since 1950 and continue to hold a number of concerts throughout the year. They can also often be heard singing in local pubs. Also on a Wednesday evening a number of traditional folk music artist congregate in the popular ale drinkers pub, The Ship and Castle. Aberystwyth give its name to a well known hymn tune. Aberystwyth RFC is the local rugby union club. It wasformed in 1947 and it plays in the Welsh Rugby Union leagues. Aberystwyth Athletic Club was formed in 1955. Aberystwyth Town F.C. was formed in 1884. There is a boxing club in Penparcau. There is a golf course in Aberystwyth that opened in 1911. Ceredigion, the county in which Aberystwyth is located, is one of the four most Welsh-speaking counties in Wales and remained majority Welsh speaking until the 2011 census. 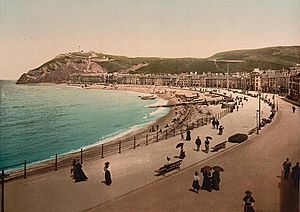 However Aberystwyth has, since its growth as a seaside resort in the Victorian era, been more anglicised than its hinterland, and the rest of the county in general. The university has also attracted many English-speaking students from England, non-Welsh speaking parts of Wales and elsewhere. The 1891 census recorded that, of the 6635 inhabitants who completed the language section, 3482 (52.5%) were bilingual, 1751 (26.4%) were Welsh monoglots, and 1402 people (21.1%) were returned as English monoglots. Ceredigion (then named Cardiganshire) as a whole was 95.2% Welsh-speaking and 74.5% monoglot Welsh. Although the town remained majority Welsh-speaking for many more decades, English had already replaced Welsh in certain domains, such as entertainment and tourism. By 1961, only 50.0% of the town's population could speak Welsh, compared to 79.5% for Cardiganshire as a whole; in 1971 these numbers had fallen to 44.9% and 67.6% respectively. The 2001 census reported that, in the seven wards of Aberystwyth, 39% of the residents self-identified as able either to speak, read or write Welsh. This is lower than Ceredigion as a whole (54%) but higher than Wales overall (19%). A Victorian camera obscura at the top of Constitution Hill. The all organic dairy unit of Rachel's Organic is based in Glan yr Afon, and is the largest private sector employer in Aberystwyth. Many comment that due to its isolation, Aberystwyth has developed its own micro-economy: while Rachel's employs 130, new Welsh Assembly offices will employ 1000; the local low-pay sector is dominated by students from the university. The Cambrian News newspaper came to Aberystwyth from Bala in 1870, after it was purchased by Sir John Gibson. Printed in Oswestry, in May 1880 the paper integrated operations in a former Malthouse in Mill Street. Owned by the Read family from 1926, in 1993 printing was contracted out, enabling the move of editorial staff to the current open-plan offices on Llanbadarn Fawr Science Park. On the death of Henry Read, the paper was purchased in 1999 by Sir Ray Tindle, whose company owns more than 200 weekly newspapers in Britain. Now printed in tabloid format, Cambrian News is the second-largest weekly-print circulation newspaper in Wales, with 24,000 copies in six regional editorial versions, read by 60,000 weekly readers. The circulation area of mid, west and north Wales covers 3,000 square miles (7,800 km2). Aberystwyth is served by Aberystwyth station, in the town centre. The station is the terminus of a two-hourly service provided by Arriva Trains Wales (most trains leave at half-past the odd-numbered hours) over the scenic Cambrian Line to Shrewsbury and Birmingham via Machynlleth and Mid Wales. Connecting services from Machynlleth also provide a link to Gwynedd's west coast as far as Pwllheli. There is no longer a southbound link to Carmarthen via Lampeter: this line fell victim to the Beeching Axe in 1965. Aberystwyth station is also the terminus of the Vale of Rheidol Railway, a steam-operated narrow gauge heritage railway. Constructed between 1901 and 1902, it was intended to ship mineral cargo, primarily lead, from Devil's Bridge down to Aberystwyth for trans-shipment. By the time it was finished, lead mining was in a deep downturn and, thanks to the Aberystwyth Improvement Company, the railway came to rely largely on the tourist industry, opening for passengers in December 1902. It still remains open for the summer season, offering a journey of 12 miles (19 km). In 1896, the Aberystwyth Improvement Company formed Constitution Hill Ltd which, under the direction of chief engineer George Croydon Marks, developed the United Kingdom's then longest funicular railway, the Aberystwyth Cliff Railway, which takes passengers up a 50% gradient. Two of Wales's important trunk roads, the A487 and A44, meet in the town, with much traffic between north and south-west Wales passing through. The B4574 mountain road linking the town to Rhayader is described by the AA as one of the ten most scenic drives in the world. 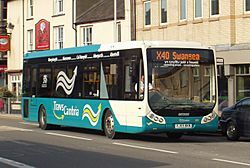 Aberystwyth is also a hub for Wales's TrawsCambria bus network. Regular direct services were provided under this network to Bangor, Cardigan and Carmarthen, along with occasional trips to Cardiff. However, the direct Cardigan service is no longer regular (reduced to 6 trips per day, with no services between 09:10 and 16:05) and the Carmarthen/Cardiff services have been removed from the TrawsCambria network and rebranded CymruExpress. A daily National Express coach to London and Birmingham also exists. The port of Aberystwyth, although it is small and relatively inconsequential today, used to be an important Atlantic Ocean entryway. It was used to ship locally, to Ireland and as a transatlantic departure point. Commercially, the once important Cardiganshire lead mines exported from this location. The importance of maritime trade in the 19th century is reflected in the fact that a lifeboat has been based at Aberystwyth since 1843, when a 27 ft boat powered by six oars was funded by public subscription and placed under the control of the harbourmaster. The RNLI took over the service in 1861 and established Aberystwyth Lifeboat Station which celebrated 150 years in 2011. The station uses the Atlantic 85-class inshore lifeboat Spirit of Friendship. The town is the setting for Koudelka, a PlayStation RPG. The fictional Aberystwyth monastery in the game is revisited in Koudelka's PlayStation 2 sequels, Shadow Hearts and Shadow Hearts: Covenant. In the setting for Classic Battletech, a star system in the Timbuktu Theatre of Alarion Province of the Lyran Commonwealth / Lyran Alliance is named Aberystwyth. Stripping Penguins Bare, the book 2 of Michael Carson's Benson Trilogy of comic novels, is set in the town and university in the 1960s. The local writer Niall Griffiths has set many of his novels here and reflects local slang, settings, and even individuals. Grits and Sheepshagger are set wholly in Aberystwyth, which also features prominently in his other novels such as Kelly and Victor and Stump. He portrays a more gritty side of Aberystwyth. Nancy Bond's A String in the Harp is set in the small coastal town of Borth, near Aberystwyth. The main characters' father is on sabbatical leave from Amherst University and working at the University of Wales, Aberystwyth. According to Douglas Adams' humorous dictionary of toponymic neologisms, The Meaning of Liff (1983), an Aberystwyth is "A nostalgic yearning which is in itself more pleasant than the thing being yearned for". The relatively obscure children's novel, Mr. Bass's Planetoid (1958), by Eleanor Cameron, has a character who claims to be from Aberystwyth, although that is never ascertained to be true. Y Gwyll (2014–), a Welsh television programme broadcast on S4C, BBC One Wales, and BBC Four, also known as Hinterland in English, is set in Aberystwyth and filmed in and around the town. Aberystwyth: historical and genealogical information at GENUKI. Aberystwyth Facts for Kids. Kiddle Encyclopedia.